Epoxy Cove Detail. Click image above to enlarge. One of the unique advantages of seamless flooring is the ability to build an integral cove base. 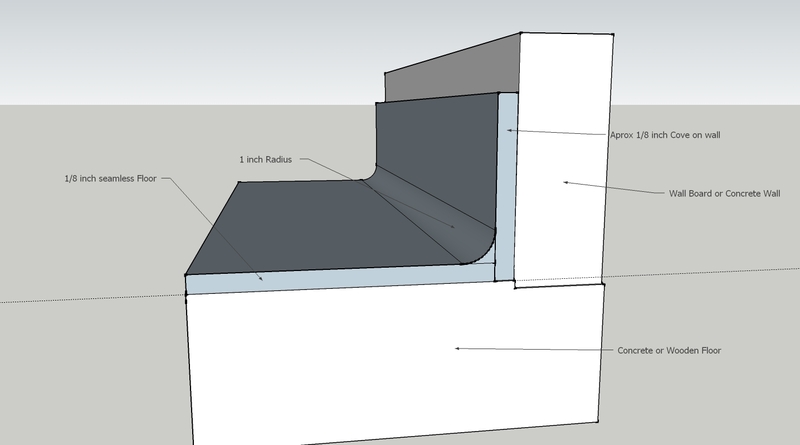 This integral cove allows you to create a virtual bathtub or shower base out of your seamless floor. Building this cove was a difficult job until the introduction of Epoxy.com Product #720 Coving Gel – www.epoxy.com/720.aspx. The coving gel is mixed with special fillers to create an easy to install custom built floor to wall base cove. All high quality installations begin with proper surface preparation. The substrate must be clean, solid and porous. The substrate must be free of paint, sealers, oil, grease or any other contaminants that will interfere with the soaking in of the epoxy primer – www.epoxy.com/surfaceprep.aspx. Be sure the floor and wall in the areas near the cove are clean. That will help prevent dragging dirt and other contamination into the cove and make the tape to mask the cove stick better. Make a small batch of Product #899 primer. Apply the primer on to the area to receive cove. This application is typically done with a brush or mini roller. It is important not to put the primer on too thick or it will run. You just need to have enough primer to give the surface to receive the cove a wet look. If you have a very porous substrate and the primer soaks in and doesn’t look wet, a second coat of primer may be required. A typical substrate that will sometimes need a second is sheetrock. If a second coat if primer is required it can be put on before the first coat has hardened. Remember never to wait more than 1 day before recoating any epoxy. Using a margin trowel “rough in” the cove mix material onto the wall where the cove is going. Be careful not to lift the tape creating the top seal in the process. Smooth the cove to shape using a cove trowel. After the cove starts to get slight stiff it is time to make a final pass at smoothing the cove with your coving trowel. Be sure not to wait too long or the tape will be difficult to impossible to remove. Be sure to keep your trowel clean so it doesn’t drag the epoxy cove material and make it rough again. Quartz coves are sealed by applying Epoxy.com Product #15 – www.epoxy.com/15.aspx. Install your floor in accordance with manufacturer’s recommendations. 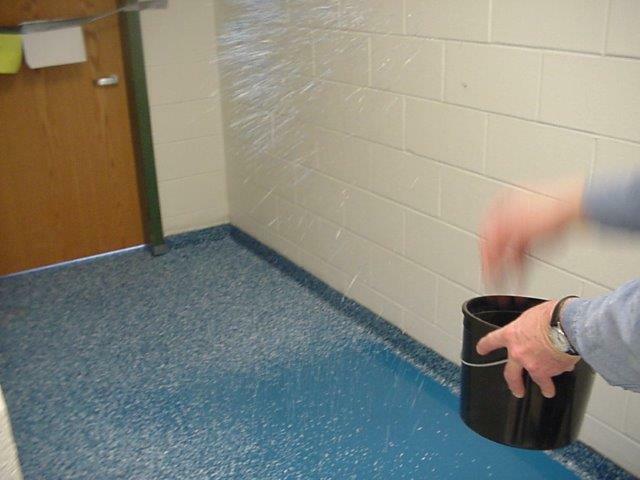 This entry was posted on Wednesday, June 25th, 2014 at 04:26 and is filed under Epoxy, epoxy education, Installation, seamless epoxy cove, seamless epoxy floor coatings, seamless epoxy flooring system. You can follow any responses to this entry through the RSS 2.0 feed. You can leave a response, or trackback from your own site.